We are only human. There are times when we just want to quit, throw in the towel, and raise the white flag. But as proven countless times, the human spirit is indomitable. Willpower, grit, and sheer determination can carry people to heights that they never thought was possible. 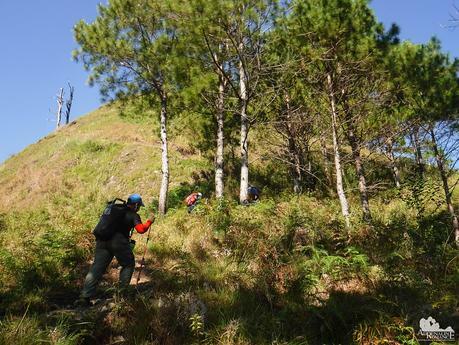 The battle between quitting and persevering was what we fought during our climb up Mt. 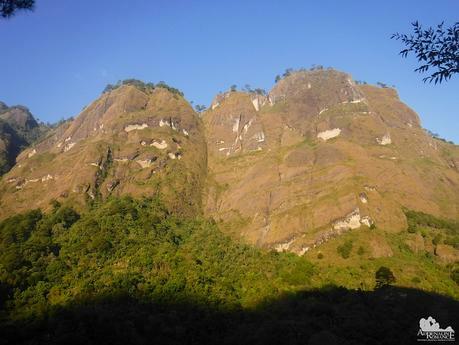 Kabunian, the third and final mountain in our Bakun Trilogy. Admittedly, we were ready to give it up. Climbing Mt. Lubo and Mt. Tenglawan, two huge mountains, in two straight days took its toll. Despite the heavy slops of liniment, coupled with massages, our leg muscles screamed in protest with every move even in our sleep. Our shoulders sagged as if our arms were too heavy for them. 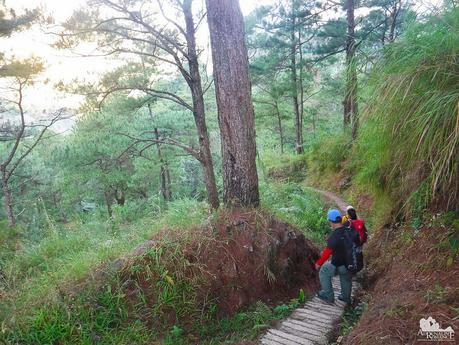 Thus, at 6:30 AM on our third day, we strapped on our Deuter backpacks and began our climb up Mt. 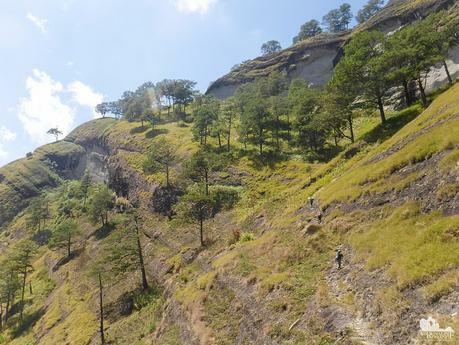 Kabunian, starting with a long flight of concrete stairs to the foot of the mountain. We were already dreading the thought of CLIMBING those stairs on the way back. Every step sent jolts of agony to our feet and legs. But the soreness didn’t matter when we saw the gigantic rock face of Mt. Kabunian. Suddenly, its beauty gave us a surge of primal energy to go on. 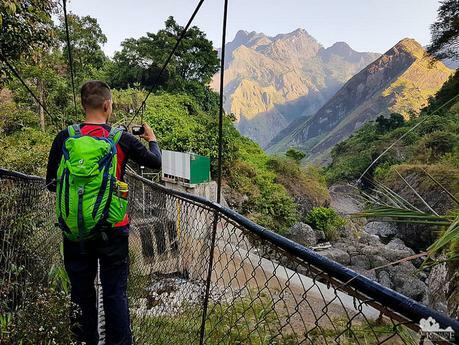 To reach the mountain’s base, we had to cross this rickety and narrow hanging steel bridge that spans over a river. The concrete structure below it is actually a part of a dam—perhaps a sluiceway. We only had a few minutes of a hike on level terrain when the trail suddenly went up at a sharp angle. “This is it!” we exclaimed. “Not really,” our female guide said, smirking. It turned out that this trail, which continues to go up for half an hour, was just the warm-up! Oh, boy, we were in for an agonizing treat! Almost an hour into the trek, we came across a junction. The left trail goes to Mt. 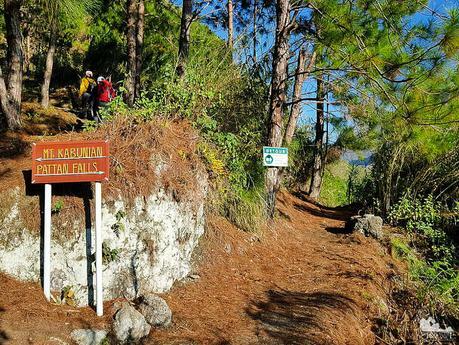 Kabunian’s peak while going straight leads trekkers to Pattan Falls. The latter is a popular place for locals to hang out, especially during the hot summer months. We would have wanted to stop by Pattan Falls. Unfortunately, at this time of the year, the waterfalls dried up. Our guide stopped and allowed us to catch our breath from the steep ascent. We thought that was steep. “See that hill? Can you see the trail?” she said. ” We’re climbing that.” Our jaws dropped in bewilderment. This first huge challenge was a massive climb that hugs the face of an almost vertical cliff. The trail, cutting across the grassland, seems to be stuck to the hillside as an afterthought. Climbing the trail sometimes involved us crawling on all fours. Or having our knees touch our chest. That’s right, it’s that steep! Wire fences were installed on the side of the trail to increase the degree of safety. Still, we need to be careful. We did not want to trust our weight to a rusty, rickety length of a wire fence supported by thin, equally rusty cables. But at some points, fences were non-existent. Check out the photo below. 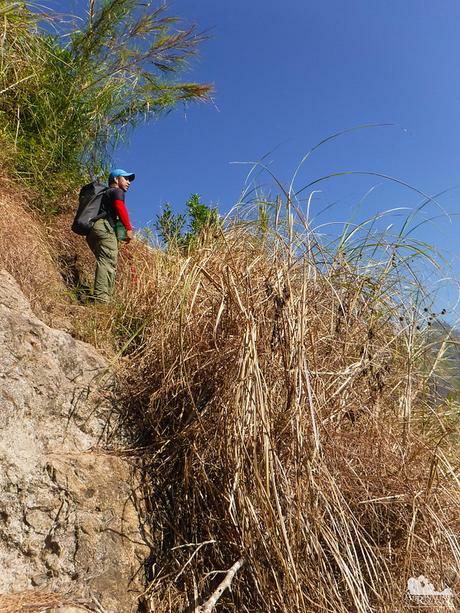 The dead cogon grass actually marks the edge of the cliff! Obviously, we exercised extreme care as we climbed and conquered this first real challenge. We breathed in relief as we reached the top of the cliff—only to find another never-ending ascending trail on another series of hills. In the open grassy terrain, there was no escape from the burning morning sun. 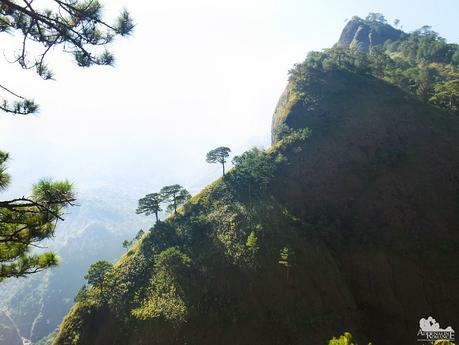 Thus, these small grooves of pine trees were great reliefs for us. We also passed by the remains of a few burned and petrified trees like this. Our guide said that lightning struck this one. Apparently, Mt. Kabunian is prone to lightning strikes, which is not surprising considering the height of the mountain. When we climbed Mt. Tenglawan yesterday and during our approach to Mt. Kabunian’s jump-off point, we saw this massive gorgeous rock wall (3rd photo in this blog post). Now, we were actually behind it! It turned out that this huge rock face is a thin wall with a very pronounced knife edge. 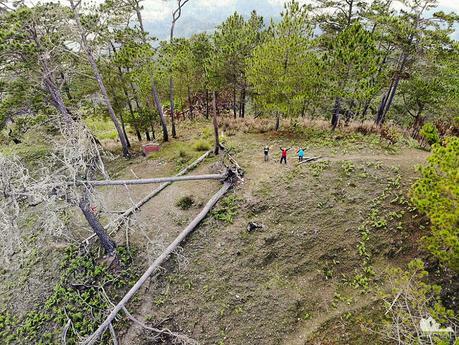 This will probably be another really cool trail for trekkers, climbers, and trail runners who want to level up their adrenaline. Looking quietly at this ridge as we passed by it, we recalled the words of TS Eliot. “Only those who will risk going too far can possibly find out how far they can go.” Indeed, you won’t be able to find out what you’re truly capable of if you don’t push yourself. We contemplated on this as we walked on the trail. We were ready to quit, but we gave it all we had. 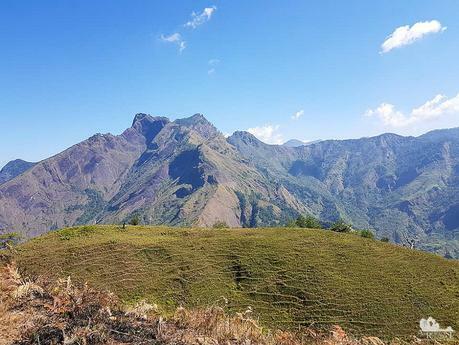 And it was surprising that despite our exhaustion, doubts, and belief that we will fail, we were definitely walking towards the summit of this majestic mountain. We can actually do this! Ah, a shed! We took quite some time here to catch our breath, massage our leg muscles, and sip Gatorade. There’s also a water source nearby, so we refilled our Nalgene bottles with fresh spring water. Then it was time to climb again. While Mt. 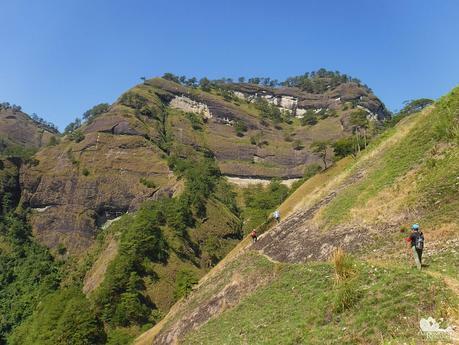 Tenglawan is the longest trek in the Bakun Trilogy, this one definitely has the steepest and most never-ending ascent—in hot, open terrain! In some areas, we need to be some tens of yards away from each other. That’s because some parts of the trail are made of loose rock and soil, which could fall on the person below us. 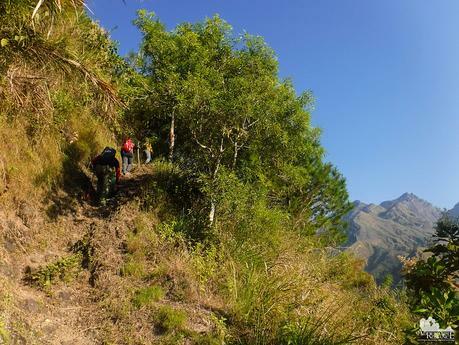 As we climbed higher, we could see that everlasting majesty of the Cordilleras before us. There were mountains and mountain ranges as far as we can see. 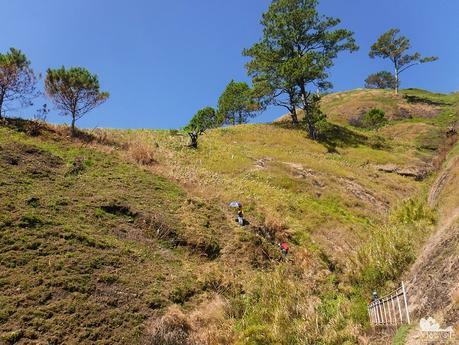 Through earthworks, geological engineering, and sheer ingenuity that was handed down from generation to generation, local Benguet farmers cultivated the bounty of these mountains. Looking at the terraces with admiration, we realized that this was a perfect synergy of man and nature. Mt. Tenglawan loomed from afar as we continued our climb. Check out the contoured, wavy features of the hill. Yup, those are natural! 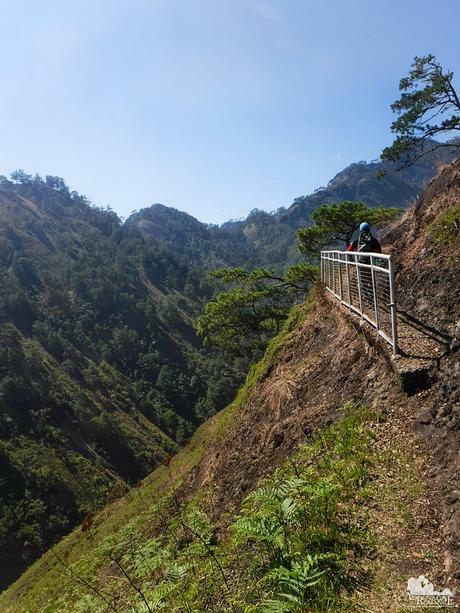 Locals carved pathways and installed safety fences on the most treacherous areas of the trail. Can you imagine the danger we would have faced if these fences weren’t installed? Oh, when is this ascent going to end? But our supposedly screaming muscles were just a distant hum after being surrounded by natural beauty all around. Just take a look at the photo below. The place definitely embodies the green pastures, hills, and meadows described in fairy-tale and children’s books. Rounding a bend, we finally saw the titanic rock wall that made Mt. 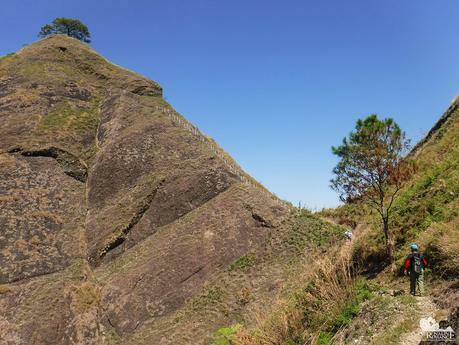 Kabunian’s summit. Although it looked near, that rock face is actually an hour away. That does not include actually climbing it! We needed to be really careful here. That’s because we were walking on a trail right beside a very steep slope. 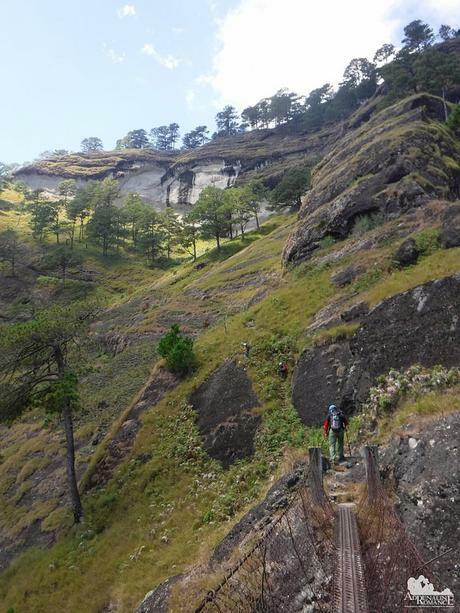 In fact, we had to shift our weights to the right and position our trekking poles at the edge of the trail so we won’t careen over the slope. The gateway to the Mt. 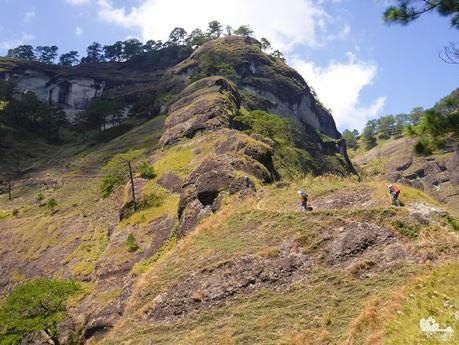 Kabunian’s crown is a set of steps locals colloquially call “Stairway to Heaven.” The steps are meticulously carved into a sharply inclined rock wall with near-vertical drop-offs on either side. Well, it definitely fits the name, don’t you think? 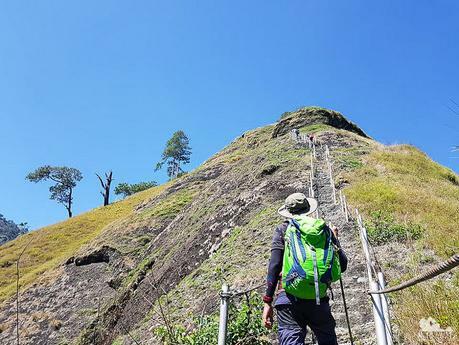 Would you climb this humongous monster WITHOUT the Stairway to Heaven? Looking up at the Stairway to Heaven directly from the base of the steps, it really does look as if it goes up to the sky! At this vantage point, we could not see the upper terminus. Locals hacked at the soft rock to create steps, and steel cables are installed as safety railings. It was a steep climb indeed! From the top of the Stairway, we could see the trail we were walking on. Notice just how narrow it is. Now you know why we were being doubly careful. Once we got past the Stairway, we continued on to scramble up these giant boulders. It’s as if the gods decided to toss some boulders to see who can throw the farthest. We crossed a rickety, rusty hanging bridge and came face-to-face with the last sandstone cliff—the last obstacle to Mt. 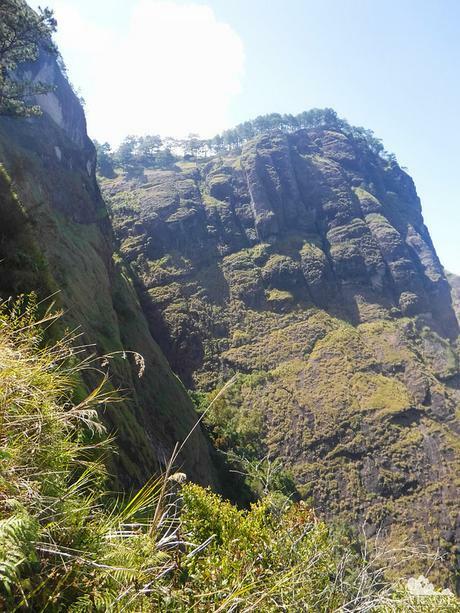 Kabunian’s summit. A large patch of cloud passed overhead, blotting out the punishing rays of the noon sun and allowing us to climb with renewed vigor. It looks so near, yet it’s so far! 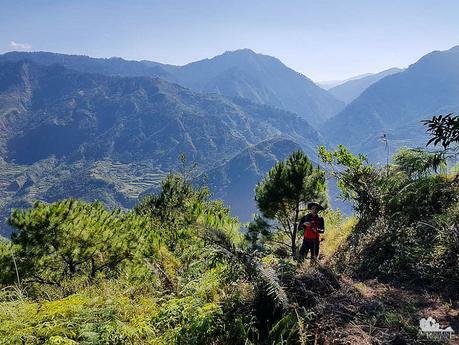 But being surrounded by spectacular scenery, breathing fresh mountain air with a tinge of pine, and far away from the noise and chaos of modern civilization, we thoroughly enjoyed this climb. Climbing Mt. Kabunian made us feel as if Mother Nature was truly embracing us. The strange thing about mountains is that everything is not what it seems. From below, the topmost thing that you could see with your eyes may seem to be the summit. But in many mountains such as this one, the supposed “summit” is just actually another part of the trail. 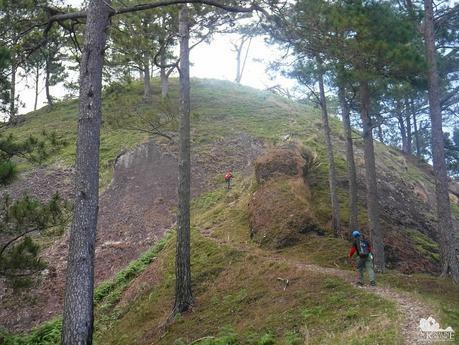 We rounded off the last sandstone cliff—only to find out that we have to walk on top of it! “It’s just up there,” our guide finally assured us. Thank heavens! Good thing because we were starving, and we were running on fumes. One more hill! Come on! 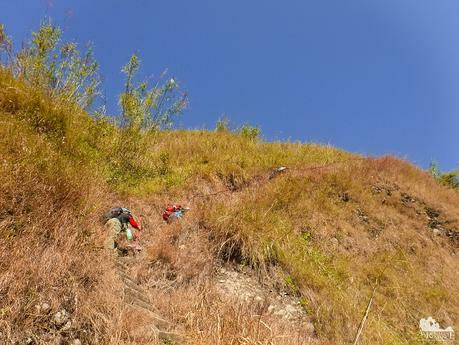 A quarter before 12 noon, almost 6 hours of trekking and climbing, we finally reached the sacred summit of Mt. Kabunian! It was an amazing feeling—with an embarrassing afterthought. Last night, we were discussing about aborting the climb. Then, contrary to what we thought, with willpower and determination, we were able to stand on the summit. If we pushed with our plan to quit, we wouldn’t have known that we can actually make it! Lesson learned: Don’t trust your doubts. After eating our packed lunch, Halourd piloted his Mavic 2 to get lovely aerial shots. Soon, it was time to leave the summit and return to civilization. It was still a long way down, but we were definitely happy the mountain granted us access to her sacred peak. As we went down, we saw a glimpse of a nearby rock wall that is hundreds of feet tall. If the rock quality is good, this could be a venue for multi-pitch big wall climbs. Because we were backtracking, we had to face the perils and walk along the treacherous trail again. From this vantage point, you can see just how narrow the trail is. You can see what a misstep can do. Here’s another aerial view of one of the sections of the trail. Can you see the steep cliffs on both sides of it? Just for scale, we are the ones wearing brightly colored Se7en shirts. 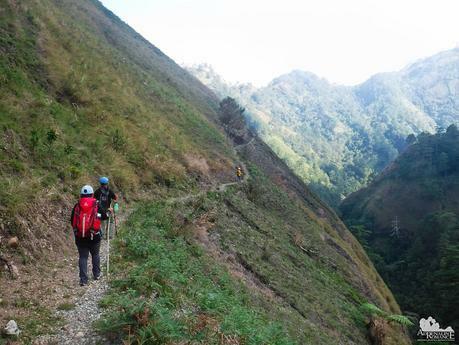 As we neared the Bakun Poblacion, we had a glimpse of the gorge that we crossed the day before when we climbed Mt. Tenglawan. From afar, we could see massive water pipes hugging the walls of the gorge. 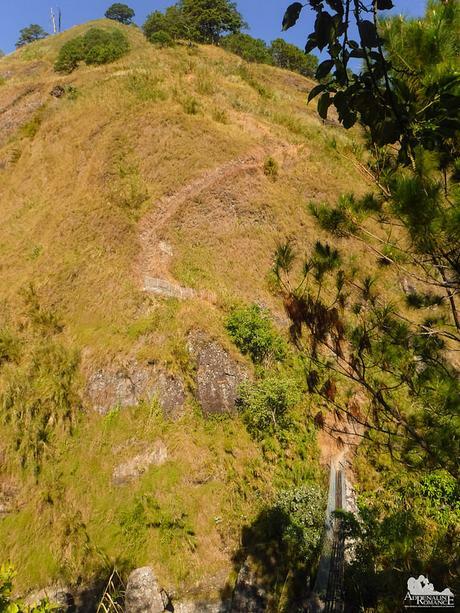 The water pipes are part of a hydroelectric dam that provides electricity around the province of Benguet. 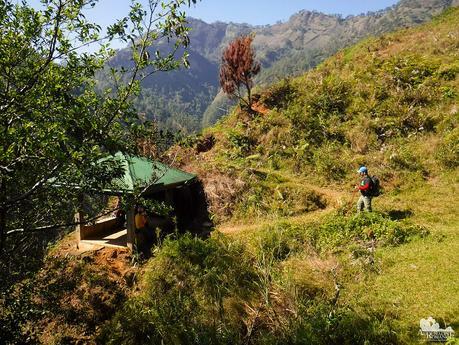 Finally, a little past 4 PM, we reached our temporary domicile in the Bakun trilogy, utterly drained, incredibly sore, but grinning with pride! Yes! We triumphed! Having successfully accomplished the challenging Bakun Trilogy, we celebrated with our first real meal since we left Baguio—a huge serving of hot and spicy chicken tinola and salted, deep-fried chicken drumsticks. The pleasant combination of our exhaustion, a satisfying dinner, and a hot bath lulled us to a deep, dreamless sleep. The morning after, we woke up early to catch the bus that will take us to Baguio. As Halourd took his drone for a final flight, we contemplated on what we have just achieved. Three colossal mountains. Three challenging days. Unearthly vistas. A constant whisper urging us to give up. A constant louder whisper that commanded us to continue moving, ignore the doubts, and believe in ourselves. We listened to the latter; it’s in our blood. 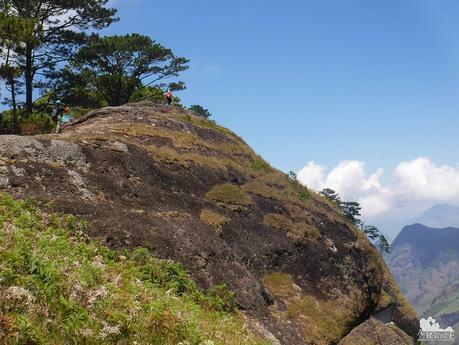 The beauty, wildness, and challenge of Bakun are simply irresistible, and we know we will return when this wilderness makes its siren call again. 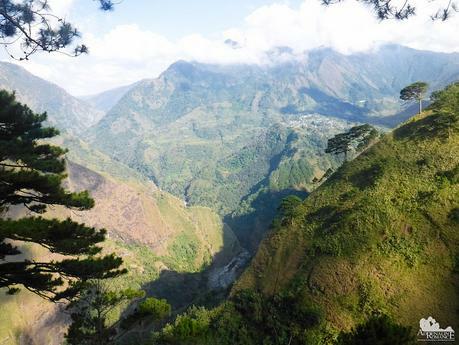 For our itinerary going to Bakun Poblacion from Clark International Airport and Baguio, click our Bakun Trilogy teaser. For transportation-related rates, click our Bakun Trilogy Teaser. * Rates are subject to change without further notice. We did not include expenses for food, souvenirs, etc. Note that each mountain in the Bakun Trilogy is under separate jurisdiction when it comes to guideship. 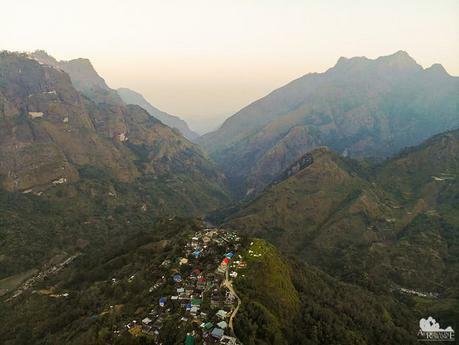 Thus, you cannot have one guide for the entire Bakun Trilogy; it’s one guide per mountain. Guide fees, overtime fees, and environmental fees are different for each mountain. 1. For contact details, check the info below. You need to get in touch with any of these contacts at least a week before your scheduled climb. 2. 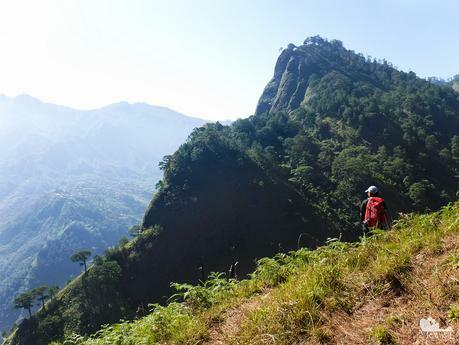 Be prepared for a long trek with lots of ascents. 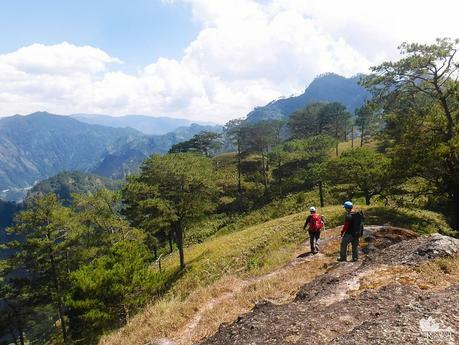 According to the guide, the average duration from Bakun Poblacion to Mt. Kabunian and back is at least 8 hours. 3. 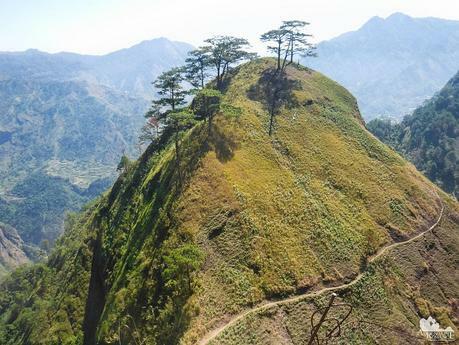 The trek to the summit is marked with narrow and thin ridges. 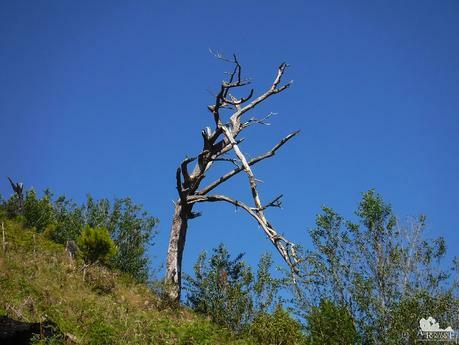 Be extra careful when climbing or walking on ridges or beside steep slopes. 4. 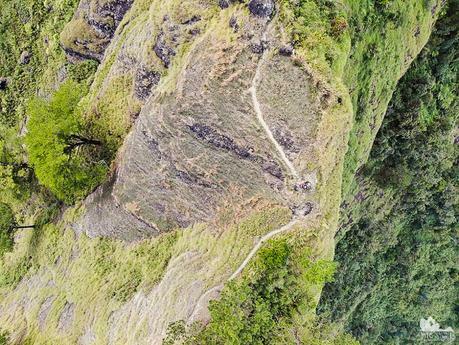 Be very careful when walking on the narrow trails as the area is surrounded by deep ravines at all sides. 5. Wear arm guards and trekking pants to protect your skin from the sun and prickly plants. Also, a dry-fit shirt or rash guard will help keep you cool. 6. 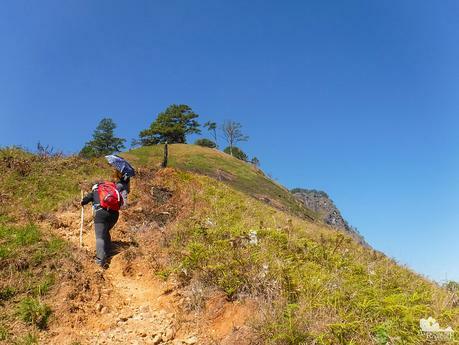 Wear trekking shoes or sandals with an aggressive tread. You will need a lot of traction since you will be scrambling over loose soil, loam, and slippery rocks. 7. Bring a lot of water because there is no reliable water source anywhere during the ascent. 11. Don’t forget to waterproof your belongings. You can do this easily by wrapping your stuff inside dry sacks or dry bags. 12. Please mind your trash; do not leave any of your garbage behind.